Mrs. Fraley, right, in 2016 with her sister, Ada Wyn Parker Lo. NEW YORK — Unsung for seven decades, the real Rosie the Riveter was a California waitress named Naomi Parker Fraley. Over the years, a welter of American women have been identified as the model for Rosie, the female war worker of 1940s popular culture who became a feminist touchstone in the late 20th century. Mrs. Fraley, who died Saturday at 96 in Longview, Wash., turns out to have staked one of the most legitimate claims of all. But because her claim was eclipsed by that of another woman, she went unrecognized for more than 70 years. 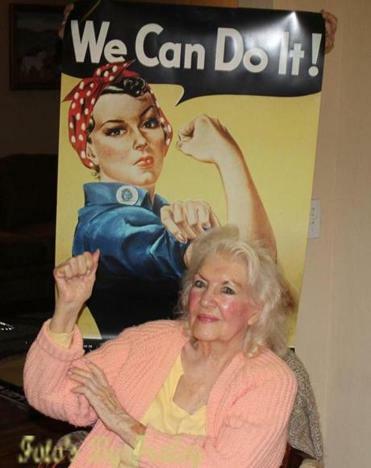 Naomi Parker Fraley in 2015 with the Rosie the Riveter poster that became a feminist touchstone. The search for the real Rosie is the story of one scholar’s six-year intellectual treasure hunt. It is also the story of the construction — and deconstruction — of an American legend, and of the power of the mass media in perpetuating it. “It turns out that almost everything we think about Rosie the Riveter is wrong,” James J. Kimble, the scholar in question, told The Omaha World-Herald in 2016. For Kimble, the quest for Rosie, which began in earnest in 2010, was “an interest that developed into a real deep curiosity that became an obsession,” as he explained in an interview for this obituary in 2016. His painstaking work ultimately homed in on Mrs. Fraley, who had worked in a Navy machine shop during World War II, as a highly likely candidate. It also ruled out the best-known incumbent, Geraldine Hoff Doyle, a Michigan woman whose innocent assertion that she was Rosie was widely accepted for years. Kimble, an associate professor of communication and the arts at Seton Hall University in New Jersey, reported his findings in “Rosie’s Secret Identity,” an article in the journal Rhetoric & Public Affairs in the summer of 2016. The article brought journalists to Mrs. Fraley’s door at long last. The confusion over the identity of Rosie’s flesh-and-blood forebear stems partly from the fact that the name Rosie the Riveter has been applied to more than one cultural artifact. The first of them — and the first to use the name “Rosie the Riveter” — was a wartime song, so titled, by Redd Evans and John Jacob Loeb. It sang the praises of a munitions worker who “keeps a sharp lookout for sabotage/Sitting up there on the fuselage.” The song, recorded by bandleader Kay Kyser, among others, became a hit. The identity of the “Rosie” who inspired that song is well established: Rosalind P. Walter, the daughter of a well-to-do Long Island family who as a young woman worked as a riveter on Corsair fighter planes and in later years was a noted philanthropist, most visibly as a benefactor of public television programs. Another Rosie sprang from Norman Rockwell, whose cover for the May 29, 1943, issue of The Saturday Evening Post depicts a muscular woman in overalls, with a sandwich in one hand (the name Rosie is visible on her lunchbox), an immense rivet gun on her lap, and a copy of “Mein Kampf” crushed gleefully underfoot. Here, too, the inspiration is beyond doubt: Rockwell’s model is known to have been a Vermont woman named Mary Doyle Keefe, who died in 2015. But in between these two Rosies lay the source of the competing claims that arose in the late 20th century and afterward, Geraldine Doyle’s included: a wartime industrial poster displayed briefly in Westinghouse Electric Corp. plants in 1943. Miller’s poster, one of a series the company commissioned from him, was never meant for public display, and barely a thousand copies were printed. Like the others in the series, it was intended only to rally Westinghouse employees, and deter absenteeism and strikes, in wartime. For decades, the poster remained all but forgotten. Then, in the early 1980s, a copy came to light — most likely one in the National Archives in Washington, one of only two known originals extant. It quickly became a powerful feminist symbol, and only then was the name Rosie the Riveter applied retrospectively to the woman in the picture. Because the Norman Rockwell image, protected by copyright, was reproduced only rarely in the postwar years, the newly anointed Rosie of “We Can Do It!” soon came to be regarded as the platonic form. It became ubiquitous on T-shirts, coffee mugs, posters, and other memorabilia. Rosie’s newfound exposure piqued the attention of women who had done wartime industrial work. Several came forward and identified themselves as having been the poster’s inspiration. The third of eight children of Joseph Parker, a mining engineer, and the former Esther Leis, a homemaker, Naomi Fern Parker was born in Tulsa, Okla., on Aug. 26, 1921. The family moved wherever Joseph Parker’s work took them, living in New York, Missouri, Texas, Washington, Utah, and California, where they settled in Alameda, near San Francisco. After the Japanese attack on Pearl Harbor, the 20-year-old Naomi and her 18-year-old sister, Ada, went to work at the Naval Air Station in Alameda, among the first of some 3,000 women to do war work there. The sisters were assigned to the machine shop, where their duties included drilling, patching airplane wings, and, fittingly, riveting. It was there that an Acme photographer captured Naomi Parker, her hair done up in a bandanna for safety, at her lathe. She clipped the photo from the newspaper and kept it for decades. During this time, Kimble was searching for the woman at the lathe, scouring the Internet, books, old newspapers, and stock-photo collections for a captioned copy of the image. At last he found a copy from a dealer in vintage photographs. It had the photographer’s original caption on the back, including the date — March 24, 1942 — and the location, Alameda. Using genealogical records, Kimble located Mrs. Fraley and her sister, Ada Wyn Parker Loy, then living together in Cottonwood, Calif. He visited them there in 2015, whereupon Mrs. Fraley produced the cherished newspaper photo she had saved all those years. “I would say there is no question that she is the ‘lathe woman’ in the photograph,” Kimble said. But an essential question remained: Did that photograph influence the Miller poster? As Kimble also learned, the photo of Mrs. Fraley at the lathe was published in The Pittsburgh Press, in Miller’s hometown, on July 5, 1942. “So Miller very easily could have seen it,” he said. Then there is the telltale polka-dot headscarf, and the general resemblance between Mrs. Fraley at her lathe and the Rosie in the poster.